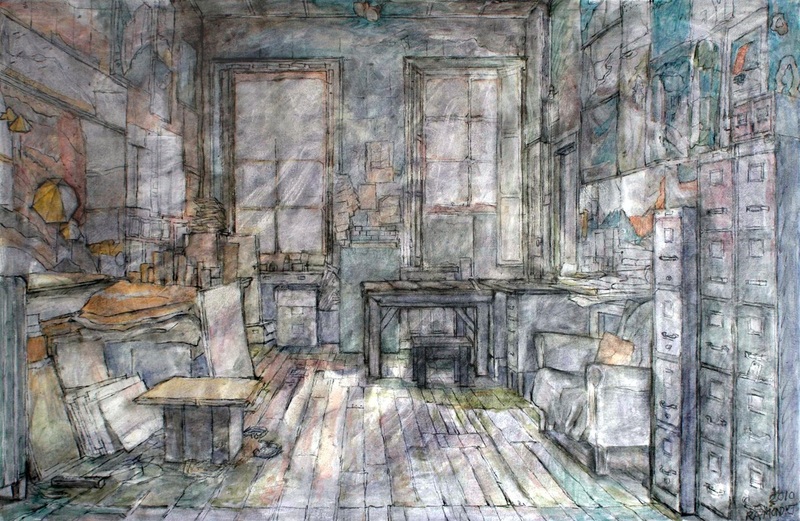 - An expression of the mysterious – enchanting, solitary and productive atmosphere of this studio … with rolls and stacks of paper, and drawings covering the walls rendered with pencil and colour wash, with varnish, to hold the effect of the misted light from the muted windows, and giving the overall suggestive quality for our mind and imagination to find some definition and intrigue. An exploration of a new technique of mine, using varnish-wash over pencils of various kinds in conjunction with colour-washes – preserving the dynamics of the first canvas-sketches and drawings that hold the spontaneous essence of every picture IDEA . . . free with no frills – the GREAT SIMPLICITY . . . leaving plenty of room for our mind’s imagination to experience the extra-dimensions of clarity of lines, depth of shadows, spaces of light. Drawings of our historical architectural environment – inspiration for our fascination of how our civilizations change through developments of building materials and engineering possibilities . . . and our creative aesthetics and styles, together with multicultural contributions.We are amazed by the jig-saw puzzle of changes over 100 years and more, as we study an historical picture of a familiar urban landscape – location. 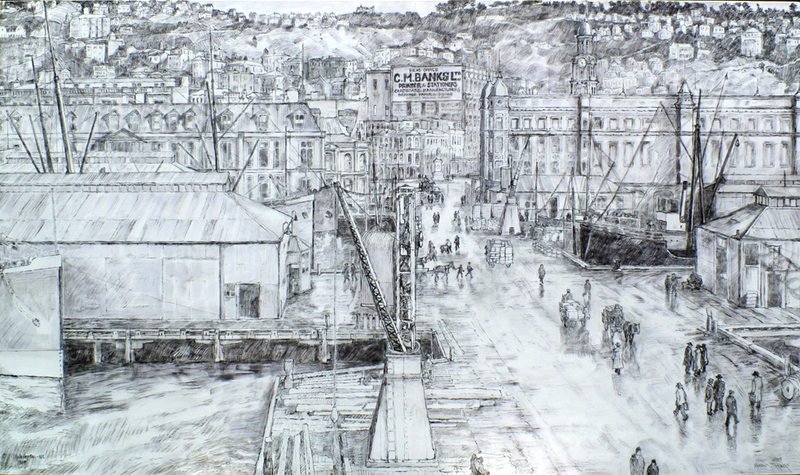 Here's a recent drawing of the waterfront heart of historic Wellington.